Beneath the layer of recognized leaders of the metal scene there has always been a world of it's own - the pillars and walls that support the mighty. Over the past years MANATARK, the premium black metal act from Tallinn, ESTONIA, has taken different forms and roles in the construction of these underground halls. 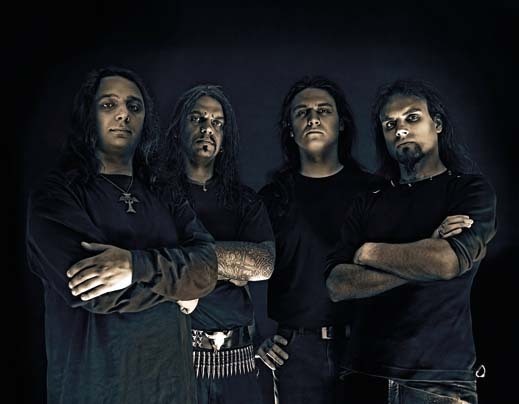 Manatark began to form as a solo project of the frontman DRACONIC in 1998. In a couple of years the project had grown into a full-time band that had released an album-length demo "Roosteitk" and toured lengthily in nearby metal scenes. Guitarist GATES had become the second part of the nucleus of the band and BENTON and THONOLAN joined them on bass and drums accordingly.By releasing the debut album "VIIMANEGI VERI" CD Manatark decided to seek a path of it's own, that wouldn't lead so much to the peaks where standard metal triumphs, but into itself, where hidden patterns of uniqueness lie. While many might say that if one intends to climb the stairs all the way to the top, it is a folly to start the journey from the very groundwork, there are some who disagree. And for Manatark, it is the opinion of these few people that matters. "We intend to steer clear of what could be called 'true' metal - there are others who do this much better than us. We enjoy lurking in the subconsiousness of the listener, we exploit the dark side of their minds," claims Draconic. "There is nothing more rewarding than being able to vibrate on the same frequency that sums up the minds you respect. And there will come a time when we are ready to move deeper, equipped to strike, taking the fan with us." By touring various places in Europe in 2001-2002, most significantly the INFERNO FESTIVAL 2002 in Norway (22 selected bands, only 7 from outside Norway) and being the support band of choice for Mayhem, Borknagar, Impaled Nazarene and headliner for many others, Manatark has established itself as one of the most remarkable metal acts from the Baltic region. Now the path is set and gates knocked down - early 2005 Manatark will record their next full-length which will share the same furious riffing and haunting melodies, bound together by an even tighter battery and a concept that will be the next chapter to the glory of Beast in Man.